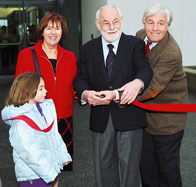 Eric Carle and his late wife, Barbara Carle, founded the Museum in November 2002. Eric Carle is the renowned author and illustrator of more than 70 books, including the 1969 classic, The Very Hungry Caterpillar. In the early 1980s, the Carles traveled to Japan, where they visited several picture book museums. Inspired, they decided to create a museum in the United States that would also honor picture books, as works of art and for their educational value. Residents of Western Massachusetts, the Carles chose a piece of land beside the Hampshire College campus in Amherst for the museum site. 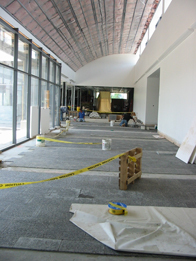 The architectural firm Juster, Pope and Frazier designed the building, which is 40,000 square feet. Friends and supporters of children’s books joined the Carles in funding construction. The Carle houses more than 11,000 objects, including 7,300 permanent collection illustrations, three art galleries, an art studio, a theater, picture book and scholarly libraries, and provides programs for families, scholars, educators, and schoolchildren. Educational offerings include professional training for educators around the country. Since its opening on November 22, 2002, the Museum has welcomed more than 750,000 visitors, including more than 50,000 school children, mounted more than 80 exhibitions, and held more than 100 workshops for educators. “I hope it will be a place to continue to thrive and grow; to be a place where the art of the picture book will be enjoyed and studied by visitors for many years to come. We hope the Museum will continue to be a place of learning, for visitors and educators, art teachers and students; a cultural and educational center and academic resource."